Retailers that would like to set up a wholesale account for stores, continue reading. Apply to access wholesale prices if you think Lynns Bath Boutique would be perfect for your shop! Products definitely offered at competitive wholesale prices. We aim to produce the most luxurious and attractive bath and body candy viable. Dramatic designs, delightful fragrances and full with generous oils and butters. Certainly, quality time and care given to each product. Likewise, Lynns’ bath and body candy are nourishing to the skin. (Read guidelines and apply below). Products come individually wrapped and labeled for Retail. 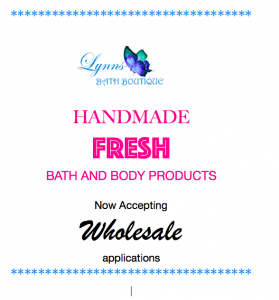 First of all, thanks for the interest in Lynns Bath Boutique’s product line of Wholesale Bath and Body Products. Next, complete the form below to start the vendor application process. Also, notifications of application approvals or denials sent by email. 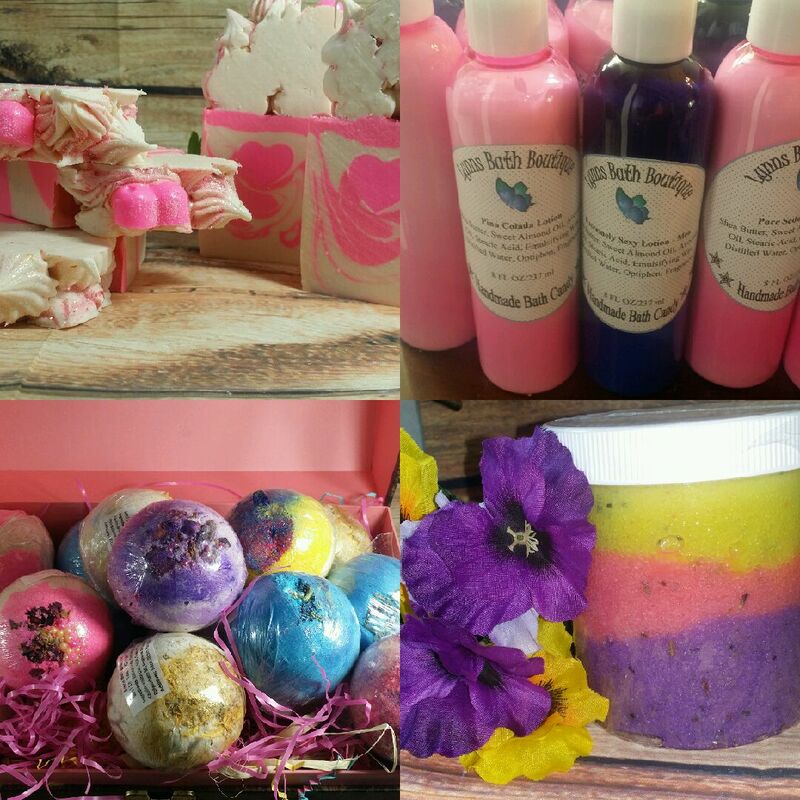 Lynns Bath Boutique currently manufactures wholesale purchases for boutiques and retailers throughout Texas and the United States. Therefore, companies that wish to stock Lynn’s beautiful products may do so. Furthermore, products made fresh to order in volume batches. For that reason, products customized for each order. Additionally, a registered business provides current TAX ID or EIN #. Most important, remember to read the guidelines and details below. Also, please answer all the fields and click “submit” to send for approval. Last, once the application approved, wholesale account details will be provided. Most of all, no minimum orders but we do have in place minimum order quantities. Orders must be prepaid in full via Paypal or credit card. Another great bonus, new retailers receive $15.00 in FREE goods with the first order. Hence, buyers will be able to try the products personally!!! Courtesy delivery for businesses located within the greater Houston, Texas area. Free shipping does NOT apply to wholesale orders outside of the general area. Shipping costs are calculated once orders are complete. Billing for shipping cost will come in a second invoice once orders are complete. Complimentary shipping within the US for orders $1000.00+. Consequently, no UPC codes provided. Another note, vendors CANNOT re-label products with their labels. This is illegal. Furthermore, no credit offers. No consignment. Most noteworthy, production times are 7-14 business days or less, however, cold process soaps must cure. As a result, soaps require 3 to 4 weeks to cure. Hot process soap is available for individuals that require product fast. Additionally, products are customized for each vendor’s order. Certainly flexible with wholesale orders. Finally, any special requests that are not currently offered, contact us. Accommodations for any reasonable special request(s) will be considered. In conclusion, for any additional questions please refer to the Policies page.